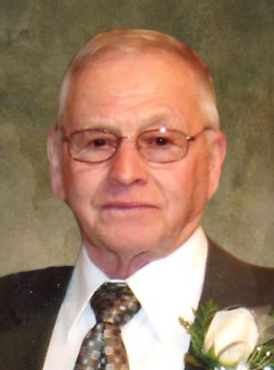 Funeral services for John Zeltwanger of Hancock, MN will be Friday, March 22, 2019 at 10:00 a.m. at the Apostolic Christian Church North in Morris. Visitation will be Thursday from 5 to 7 p.m. at the Apostolic Christian Church North and for one hour prior to services at the church on Friday. Burial will be at the Apostolic Christian Church Cemetery, rural Morris. John Carl Zeltwanger was born on January 8, 1931 to William and Lillian (Eisenmann) Zeltwanger in Moore Township, Stevens County, Minnesota. John was baptized at the Apostolic Christian Church in Hancock. He grew up and attended school in Hancock, graduating with the Hancock High School, Class of 1949. John enlisted in the United States Army and served in the Korean War. On April 3, 1955, John was united in marriage to Mabel Schmidt in West Bend, Iowa. They made their home on a farm near Hancock, Minnesota. Together they farmed and raised cows, pigs, corn and beans. John loved his cattle and could always tell when they were sick. They were blessed with one daughter, Connie. John continued to live on the farm until he became a resident at the West Wind Village in Morris. John was a member of the Apostolic Christian Church, Morris North, in Morris. He enjoyed singing and was the song leader at church for many years. John’s two claims to fame was that he never let anyone around his end in high school football and when he won the mile in the section track meet at St. John’s with one shoe! He loved farming and watching sports – particularly watching his grandkids play. John cherished the time he was able to spend with his family; but was known to sneak away during family functions to take care of the livestock. John died on Tuesday, March 19, 2019 at West Wind Village in Morris, MN. He was 88 years old. John is survived by his wife: Mabel Zeltwanger of Hancock; one daughter: Connie (Steve) Nuest of Morris; three grandchildren: Cory (Shannon) Nuest of Becker, Chad (Kalee) Nuest of Hancock and Ashlee (Claudy) Francois of Hancock; 8 great-grandchildren: Courtney, Danielle and Troy Nuest, Abigail, Jett and Cash Nuest and Lia and Emerson Francois; one sister: Ila (Harold) Gramm of Hancock; two brothers: William Zeltwanger, Jr of Indianapolis, IN and Lyle (Marilyn) Zeltwanger of Valparaiso, IN; brother-in-law: Floyd Schmidgall of Morris; and many nieces and nephews. In lieu of flowers, memorials preferred to the family to be used for church missions.